Writemyessaytoday.net: Is It the Fastest Writing Service? 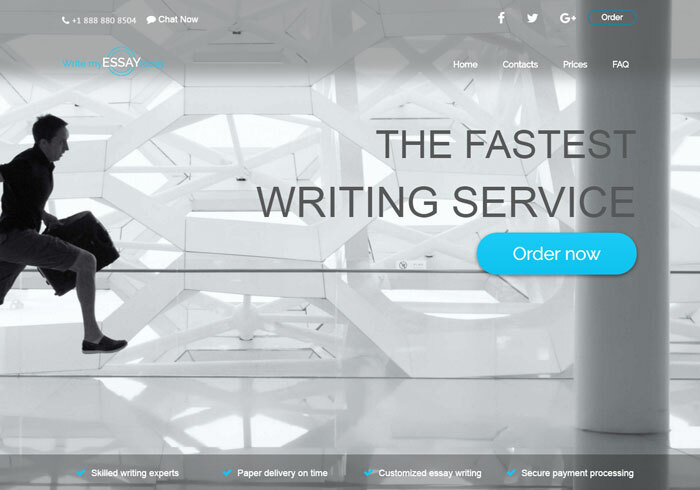 The homepage of the service assures the customer that they have found the fastest and the best service for writing paper. Such a claim is a regular thing, but meeting this claim is more an exception than a rule. Moreover, there are phrases like “Try “Write My Essay fast”, which are oriented more towards search engines than towards the customer. Let us review the service, its possibilities and quality of delivery to see whether it is good for an average student. The first thing to check about a writing service before ordering with it is what it guarantees. On this point, we have found some contradictory information while surfing through the website. On some pages, the agency claims to deliver 100% original papers. However, when checking the details of their terms and conditions, you will find the information saying that 10% plagiarism is allowed, and that is to exclude title and references pages. This may be crucial if you work on a lengthy paper, let us say on a dissertation, because the whole chapters may be copied. Another curious thing: when reading Terms and Conditions you may get linked to Revision Policy and Money Back policy pages to check the information on those issues. However, even though we were checking all the pages, we did not find such pages, and consequently – no revision and refund guarantees. The only thing we managed to learn is that the service offers 3 revisions for free, which is not much for a poorly done paper. Moreover, there is no grade guarantee. So, if you fail, this is your problem. The offered prices are average and look quite affordable. The FAQ page tells us that there will be some discounts on the pricing page, but we were not lucky to see any. The first step of the order form requires you to enter your personal information and contact details, and this looks like a trap. The minimum deadline offered is 3 hours, although as for the fastest service we expected to see 2 or even 1-hour deadline. There is one extra feature you can pay for: a VIP customer service. If you pay extra 10% to the total, you are supposed to get a special attitude from the support team. The question is: what happens if you do not pay extra? Will the support be ignorant and rude to you? Finally, we risked placing an order with the company. We ordered a History paper to be completed within 3 hours, and we needed one page, so there was enough time to do it well. The paper came around 20 minutes late (too long for the so-called “fastest service”) and it looked like a high school student wrote it, though we needed a university paper. Our team can give 4 out of 10 to this service, and we would recommend searching for the better online writing option.